Gluten Free Crunch Brownies | Great gluten free recipes for every occasion. When it’s 3 days before Christmas and you’ve already made alllllll the 2014 Gluten Free Christmas Cookies, what’s to talk about? Well I’m glad you asked! 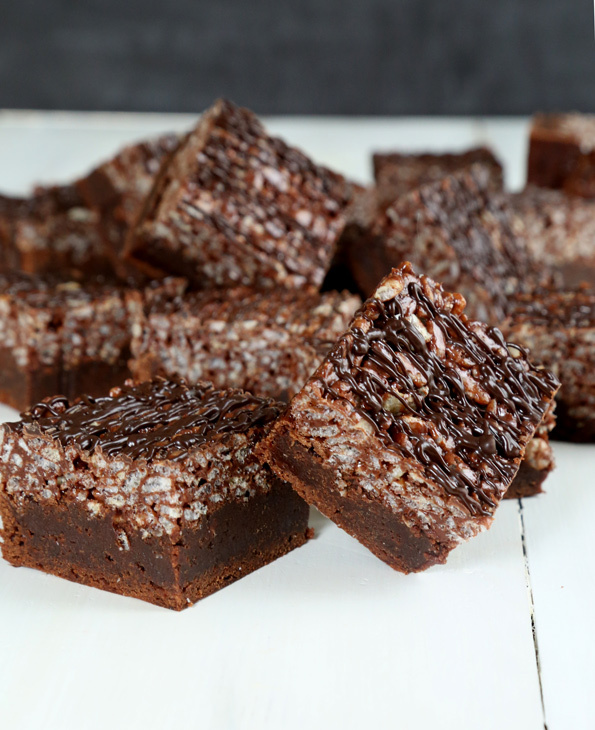 These gluten free crunch brownies are a welcome addition to any cookie plate (or box! ), as they’re a lovely change of pace from your regular cookie fare. The recipe is adapted from Mel of Mel’s Kitchen Cafe’s recipe for Killer Crunch Brownies, and I have to admit I changed them all around but the concept of a rich brownie layer and a rice krispie treat style top is purely Mel’s (well, purely the concept of a former coworker of Mel’s husband Brian but you get the idea). My children always want me to make them Rice Krispies Treats, and since I bake all.the.time anyway I just don’t do it for them, like, ever. My recipe with the homemade marshmallows is so super easy, though. I guess I should feel guilty that I regularly deny them such a simple childhood pleasure, but, well, I don’t! “Deprived” is not generally a word I’d use to describe my 3 children, but I guess deprivation is in the eyes (and mouths) of the beholder. The brownie layer I made has a bit of sour cream in place of some of the butter I’d normally use in fudgy, rich brownies. It does a wonderful job of making these gluten free brownies a lovely cross between cake-like brownies and fudge-style brownies. I also baked some miniature marshmallows into the brownie batter (not a lot—just a cup), but you can leave them out. 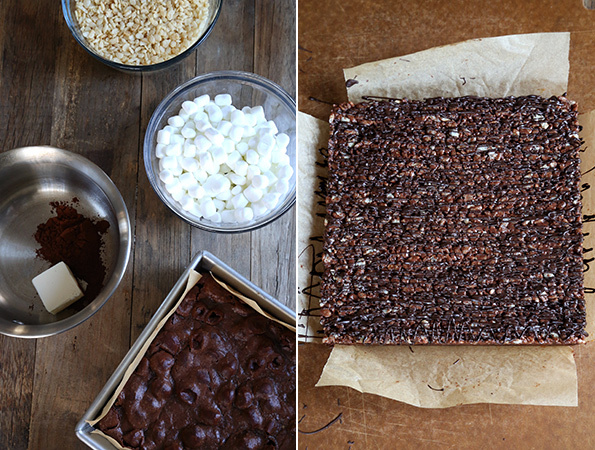 It helps tie the brownie layer itself to the rice krispie treat layer. You feel me? These really are simple to put together, and you can make them almost as far ahead of time as you’d like (with only 3 days left before Christmas, I see how that isn’t a big selling point, but it’s a concept—go with it). I drizzled the top lightly with some melted chocolate, but I have to be honest that I’m not even so sure you can taste it. It’s more for dramatic effect than anything else. 1. If you don’t have sour cream, you can try replacing it with Greek-style yogurt (nondairy should work just fine, too). 2. To make these dairy-free, I’d try replacing the butter with butter-flavored Spectrum nonhydrogenated shortening, or Earth Balance buttery sticks. Either should work fine, but you’ll have to experiment because I haven’t tried it. 4. In the U.S., Kraft Jet-Puffed miniature marshmallows are gluten free, as are Campfire brand. *You can also use my recipe for Super Fudgy Gluten Free Brownies for the brownie layer, if you prefer. Preheat your oven to 350°F. Grease an 8-inch x 8-inch baking sheet, line with crisscrossed sheets of unbleached parchment paper, both sheets long enough to overhang the sides of the pan and greased in between. These will be the “handles” you use to lift the brownies out of the pan. Set the pan aside. Make the brownies. In a small, heat-safe bowl, place the chopped chocolate and butter, and place over a pan of simmering (not boiling) water, making sure the bottom of the bowl doesn’t touch the water. Stir occasionally until melted and smooth. Remove the bowl and set it aside to cool briefly. Add the sour cream to the melted chocolate mixture, and mix to combine. In a large bowl, place the flour blend, xanthan gum, salt, and granulated sugar, and whisk to combine well. Create a well in the center of the dry ingredients. add the eggs and vanilla, and mix to combine. Add the melted chocolate and butter mixture, and mix again to combine. The batter should be thick but smooth. Stir the (optional) miniature marshmallows into the brownie batter until evenly distributed throughout. Scrape the batter into the prepared pan and spread into an even layer with a wet spatula. If you’ve added the marshmallows to the batter, they will make it lumpy. Place the pan in the center of the preheated oven and bake just until firm to the touch and a toothpick inserted in the center comes out mostly clean (about 22 minutes if you haven’t added the marshmallows, and 25 minute if you have). Allow to cool completely in the pan. 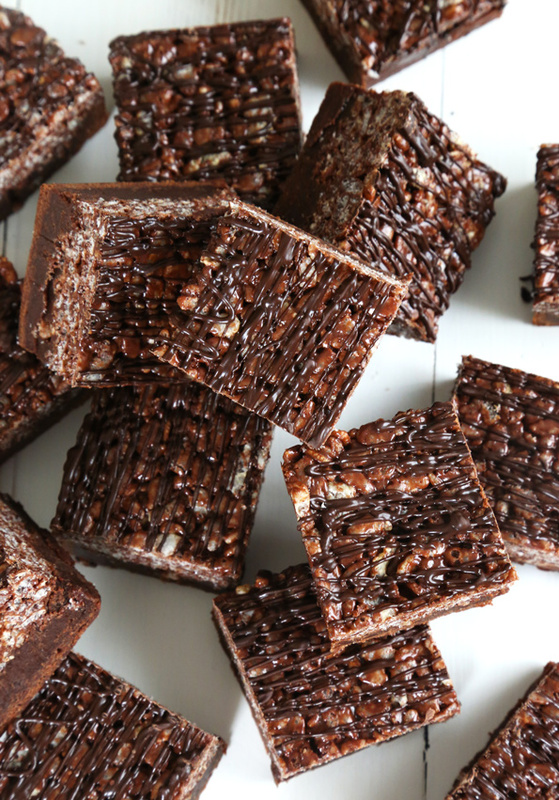 While the brownies are cooling, make the crisp rice layer. Place the crisp rice cereal and salt in a large bowl, and toss to combine. Set the bowl aside. Place the butter and cocoa powder in a medium-size, heavy-bottom saucepan and melt the butter over medium heat, stirring the mixture occasionally. Add the marshmallows and continue to cook, stirring constantly, until the marshmallows are just melted. Remove from the heat and allow to cool briefly until the marshmallow mixture is no longer hot to the touch (otherwise, the crisp rice layer may taste as if it is stale, even if the cereal is fresh). Pour the marshmallow mixture into the bowl of crisp rice cereal and stir to coat the rice cereal completely in the marshmallow mixture without crushing the cereal. 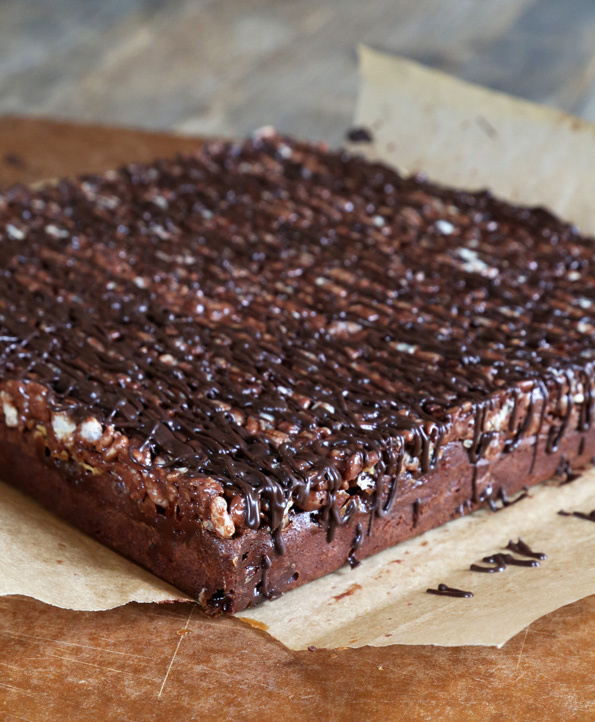 Transfer the cereal mixture to the pan of cooled brownies and press firmly into an even layer on top of the brownies. Allow to sit at room temperature until set (about an hour). Drizzle with the (optional) melted chocolate and allow to sit again until set (5 minutes). Remove the brownies from the pan using the overhung parchment paper, place on a cutting board and slice into 16 squares before serving. Adapted from the Killer Crunch Brownies recipe on Mel’s Kitchen Cafe. Hi, Mel! P.S. Did you know that the Gluten Free on a Shoestring Cookbooks make great holiday gifts?? Give the best gifts and support this blog at the same time! You mention vanilla in the directions for the brownies, but it is not listed in the ingredients. Fixed! Sorry about that, Lori. I did not know that Kraft’s minimarshmallows were gluten free. Thanks for mentioning that. Oh yummy! We’re having 2 Xmas dinners. This will now have to be dessert at dinner #2 on Saturday. Wow, Mare! You’re gonna be busy. Hope they’re both merry! My son is cooking dinner 2 on Saturday because that is when his girlfriend will be with us. I just have to do the dessert. I think I am going to make him cook dinner 1 too so he can learn how to do Prime Rib and Yorkshire Pudding (using your popover recipe of course). He is the cook in his house and wants to learn our traditional meals.